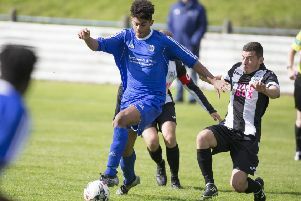 Hawick goalkeeper Craig Saunders suffered a cruel bout of luck on Saturday (archive image). Hawick had a squad of only 14 players, including two trialists, to take to New Victoria Park on Saturday. So it was perhaps little wonder that the game, once again, was effectively over for them by half time. Paul McGovern’s squad was ravaged once again by late call-offs, with players unavailable through injury, work commitments, illness or holidays. However, the Royalists’ gaffer admitted his side had shot themselves in the foot by giving away two preventable goals early in the first half, while ‘keeper Craig Saunders was the unfortunate victim of a goalkeeping blunder for the third. 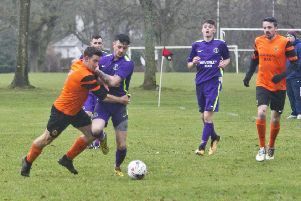 Star were largely uninspiring in collecting the points, however, reported Brian Nimmo, as they looked flat at times under new management duo Colin Affleck and Jamie Burrell’s first game in charge. Star nevertheless got off to a flying start in four minutes when a ball in the box was brought down by Stevie Thomson, who was given too much time and room in the box by the Albert defence. He swivelled sharply and fired a low shot into the bottom corner, with Saunders looking on. Star increased their lead two minutes later, after a corner from the left was headed out for a second one. Thomson took the inswinger from the right, where Dale Richardson was on hand to power a header home from around seven yards. Hawick’s Lithuanian centre back, Egidijus ‘Eggy’ Savickas, claimed he’d been pushed from behind while on the front post, but the goal stood. On eight minutes, Albert were forced into two goal-line clearances following a scramble in the box. The Albert had created very little in the way of chances and the 34th minute proved a nightmare for Saunders. A hard, straight 30-yard drive from Thomson struck him on the hands and chest and looped over him into the net to make it 3-0. However, Hawick stemmed the flow after half time by playing five across the midfield, producing a more rugged performance. He added: “I was proud of the second-half performance – the players went out and took things on board and did what I asked of them. Star had some opportunities in the second half but could not score, while on 86 minutes, Albert’s Dom Pacitti fired a 20-yard effort straight at home ‘keeper Renton. “A defeat is a defeat and we have not managed to score. “I was under no illusions and had to be realistic – with the squad I had, it was always going to be hard. But I was pleased with the reaction I got in second half from my players against a top side. Tomorrow’s (Saturday) opponents, Leith Athletic, had a disappointing result at the weekend, losing 2-1 at Arniston Rangers, so McGovern hoped to have as many players back at Albert Park as possible. Demba Thiam would be available again after suspension, while Declan Knox may also be back, he added.